We are specialists in safe non-surgical treatments to enhance your natural beauty. All the treatments offered are carried out by professionals trained specifically in the procedures offered. The term LASER originated as an acronym for Light Amplification by Stimulated Emission of Radiation. In other words a Laser is a device that emits a high energy beam of light of any spectrum (visible, infra-red, UV etc). The use of lasers for medical procedures developed in the 1960s as cutting tools but since then has developed a wide range of uses from skin treatments & hair removal to vision correction. 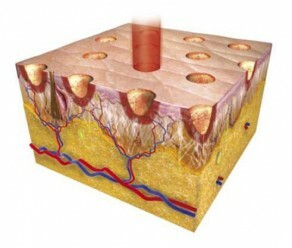 Skin Resurfacing Lasers are known technically as “selective photothermolysis” lasers. This is due to the fact that they have been designed to “selectively” target the skin by using light (photo) to damage the skin through heat (thermolysis). The light heats the water held within the skin causing the water and tissue to turn to vapour. There are 2 types of Skin Resurfacing Laser; Ablative and Non-Ablative. Ablative Lasers use this method of vapourising the water and tissue to remove the outermost layers of skin in a precise and controlled manner. The skin will heal over a period of time, resulting in the production if new layers of collagen. Once healed there will be a vast improvement in the appearance of the skin with a reduction in pigment from sun damage, lines and wrinkles. There are 2 main types of ablative laser – carbon dioxide and erbium:YAG. Non-Ablative Lasers have a lower energy level than their ablative counterpart and aim to cause damage within the dermal part of the skin leaving the outer layers intact. This reduces the recovery time post-operatively but gives a more conservative result in terms of the improvement of lines and wrinkles. The types of non-ablative laser used in practice are more commonly Intense Pulsed Light, Light Emitting Diode and Light Heat Energy. This is the adapted use of the conventional Ablative Laser resulting in “Fractional Photothermolysis”. Instead of targeting the whole top layer of skin the fractionated Laser targets smaller spaced areas leaving undamaged skin in between. This causes a much reduced amount of damage allowing the skin to heal much quicker than if the area was fully ablated. Though this technique can be applied to a non-ablative laser again its efficacy is far inferior to the fractionated ablative laser . We offer Fractionated CO2 Laser Resurfacing or Fractionated CO2 Ablative Photothermolysis treatment. Primarily it rejuvenates by promoting the skin to increase its cellular turnover and lay down new collagen. It is mainly used to reduces and remove fine lines, refine the texture of scarred and pitted skin, reduce age spots & blemishes and help to repair sun damage on the face, neck, shoulders and hands. Your skin should be thoroughly cleansed and dried, removing any makeup, creams, oils, topical anaesthetics or self-tanning products before laser treatment. The intended treatment area should not be exposed to sunlight or tanning booth light for 14 days prior to treatment. Treatment is repeated after the skin has healed sufficiently. Firstly a thorough consultation is carried out to determine your expectations from treatment and to let you know what results you can expect. Analysis of your skin is carried out to determine any contraindications to treatment and any risk factors that may be involved for your individual case. The area of concern is then treated by the laser, small areas are treated sequentially. This will result in a mild redness of the skin and some temporary white dots. The white dots show the areas where the laser has penetrated the skin and vapourised the tissue. The white dots disappear after a few minutes but the redness will remain. A typical treatment of the full face takes approx. 30 minutes. Once complete we apply cold microfibre masks to cool the area treated as quickly as possible. The cold microfibre masks are replaced as needed to reduce any heat that can result from the vasodilation following treatment. The laser creates a beam of intense infra-red that deeply penetrates the skin tissue, causing a ‘zone’ of heat. This stimulates collagen and results in tighter, more youthful looking skin. See the Laser Tightening Science below for more a more detailed explanation. The number of sessions is approximately 3 or less but this depends on the area being treated and the condition of your skin. Many factors impact the efficacy of individual laser treatments, including the severity of the condition being treated. You will see improvement following the FIRST treatment, as your skin heals it will visibly tighten, pulling all the wrinkles taut. Though this is a far less intensive procedure than full ablation there is damage to the skin and as a result there will be some redness and possible swelling after the treatment which can last from 2 – 7 days. Although it is possible to return to work immediately most people take approximately 5 days off work, or have the procedure done on a Wednesday/ Thursday as after a few days the skin can discolour to a dark brown before it is naturally exfoliated. The skin can be quite flaky for 2 – 3 weeks.